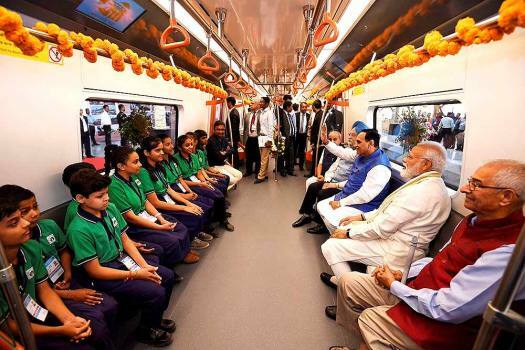 Prime Minister Narendra Modi travels in Metro train, in Ahmedabad. 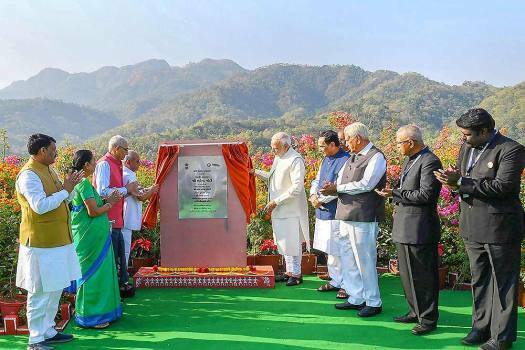 Gujarat Governor O.P. Kohli and Gujarat Chief Minister Vijay Rupani is also seen. 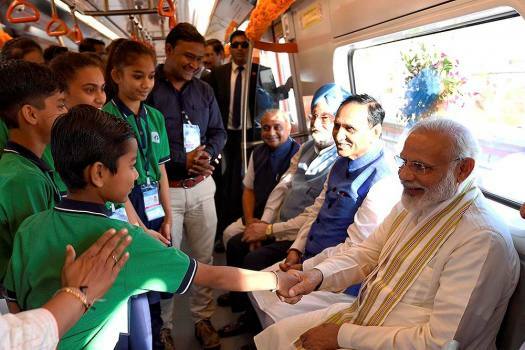 Prime Minister Narendra Modi interacts with children in the metro train, in Ahmedabad. 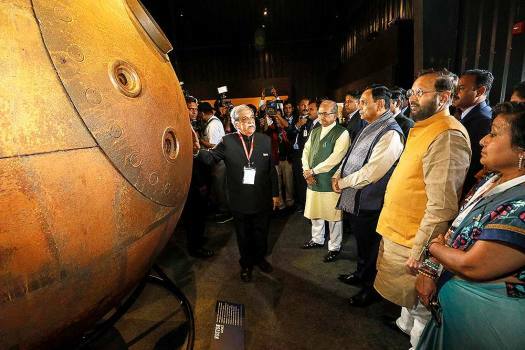 Gujarat Chief Minister Vijay Rupani is also seen. 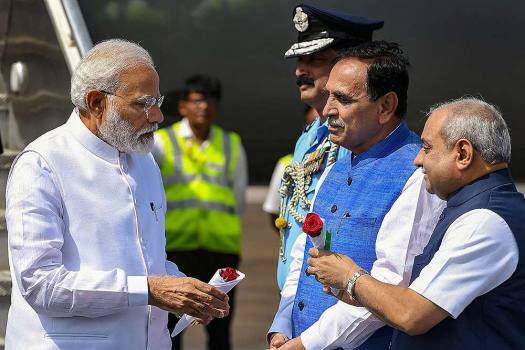 Prime Minister Narendra Modi being received by Chief Minister of Gujarat Vijay Rupani and his deputy Nitinbhai Patel, in Jamnagar. 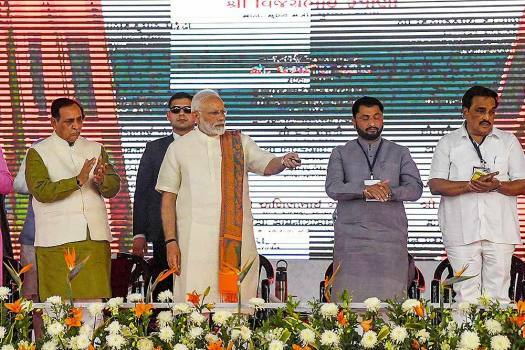 Prime Minister Narendra Modi lays the foundation stone for extension of Terminal Building of Surat Airport. 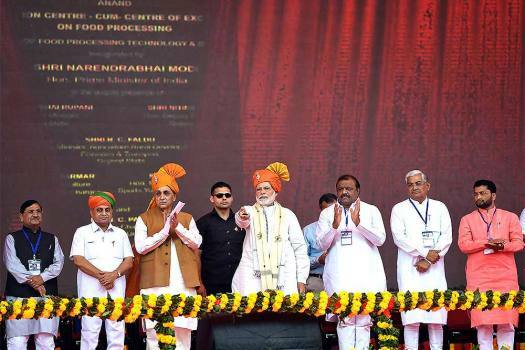 Chief Minister of Gujarat Vijay Rupani is also seen. 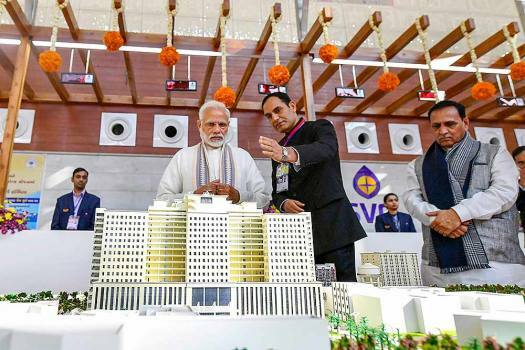 Prime Minister Narendra Modi with Gujarat Chief Minister Vijay Rupani visits the stalls at 'Vibrant Gujarat Global Trade Show', in Ahmedabad. 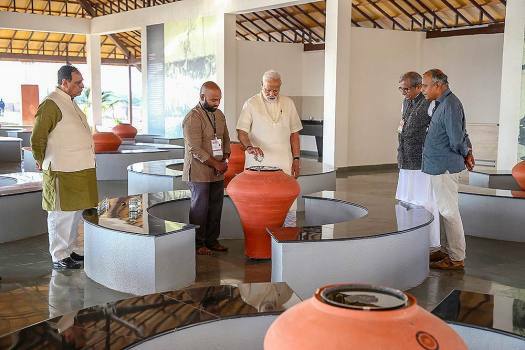 Prime Minister Narendra Modi inspects the facilities at Sardar Vallabhbhai Patel Hospital at its inaugural ceremony, in Ahmedabad. 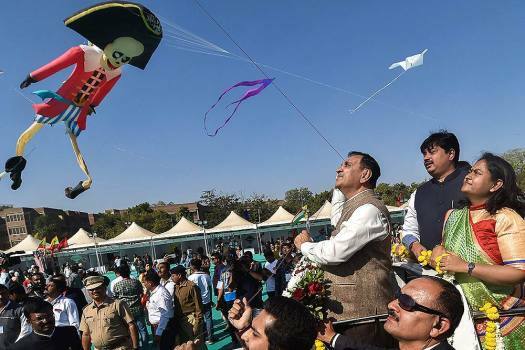 Gujarat Chief Minister Vijay Rupani flies kite during the International Kite Festival, in Ahmedabad. 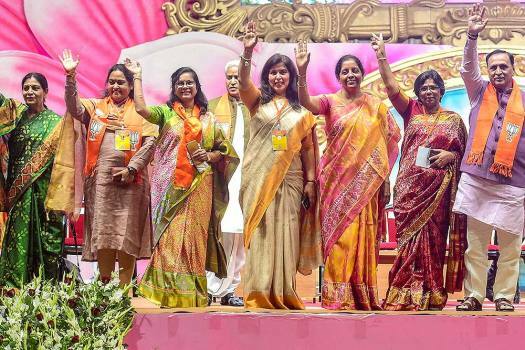 Defence Minister Nirmala Sitharaman with Gujarat Chief Minister Vijay Rupani and BJP women's wing leaders during the BJP women's wing National Convention, in Ahmedabad. 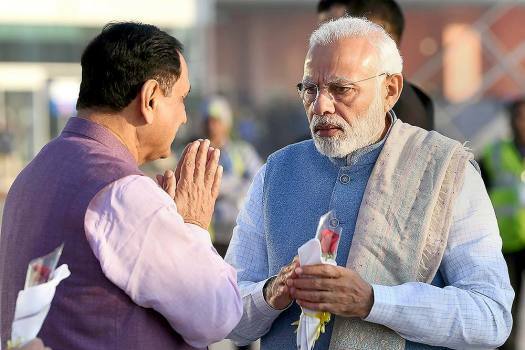 Prime Minister Narendra Modi being received by Gujarat Chief Minister Vijay Rupani, on his arrival in Vadodara. 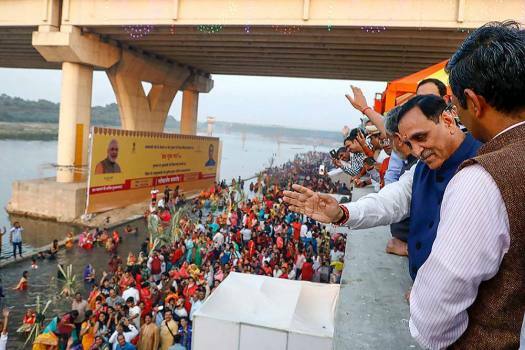 Gujarat Chief Minister Vijay Rupani waves at devotees gathered to worship the Sun god during Chhath Puja on the banks of the Sabarmati river, in Ahmedabad. 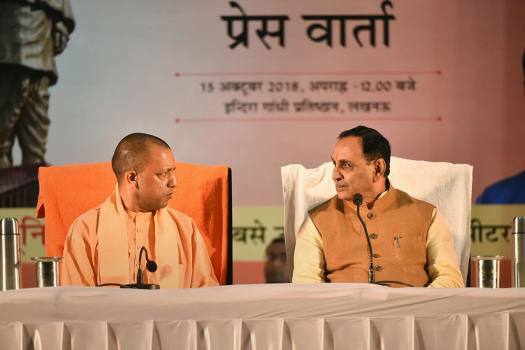 UP Chief Minister Yogi Adityanath and Gujarat CM Vijay Rupani at a press meet in Lucknow. The airline had taken a 'cue from the Election Code of Conduct', a GoAir spokesperson said, adding that its team in Srinagar inadvertently used unused stock of 'Vibrant Gujarat' paper. 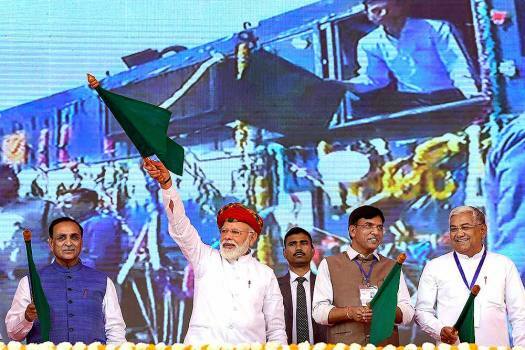 The Bharatiya Janata Party launched its rally from Mehsana, the north Gujarat region dominated by the Patel community. 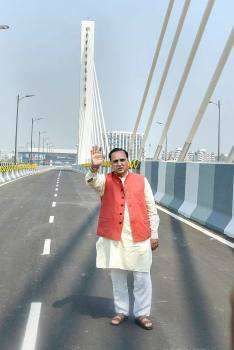 Chief Minister Vijay Rupani on Sunday announced that his government will implement the reservation provision from January 14. 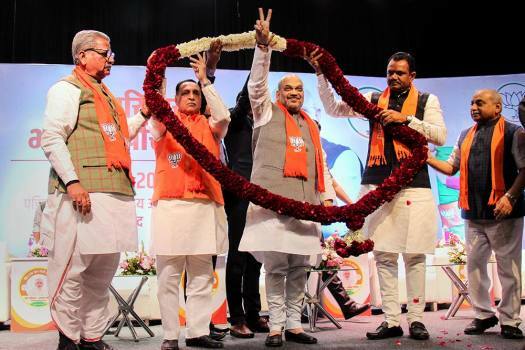 Rupani said instead of engaging in "appeasement politics", the BJP government in Gujarat has adopted the motto of "appeasement to none, justice to all". 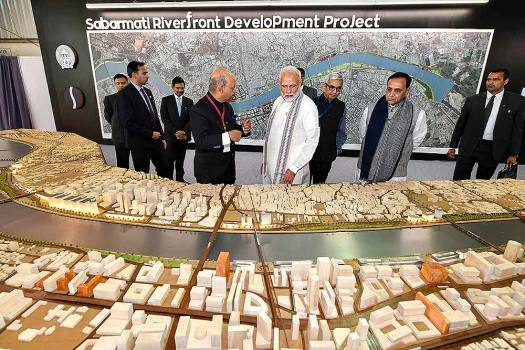 “Total 6.22 lakh connection holders in rural areas across the state will be benefited with this waiver to the tune of Rs 650 crore pending electricity bills,” Gujarat’s energy minister Saurabh Patel said. 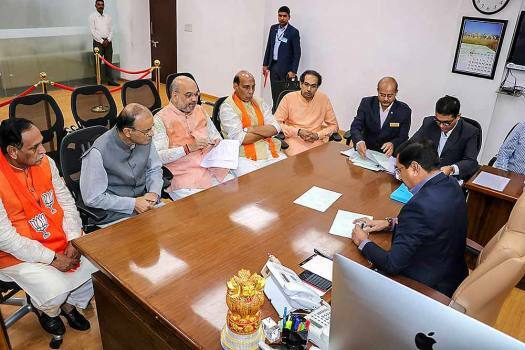 CM Adityanath asked everyone to cooperate with the state government while hailing the steps taken by the Gujarat chief minister for maintaining peace and normalcy. 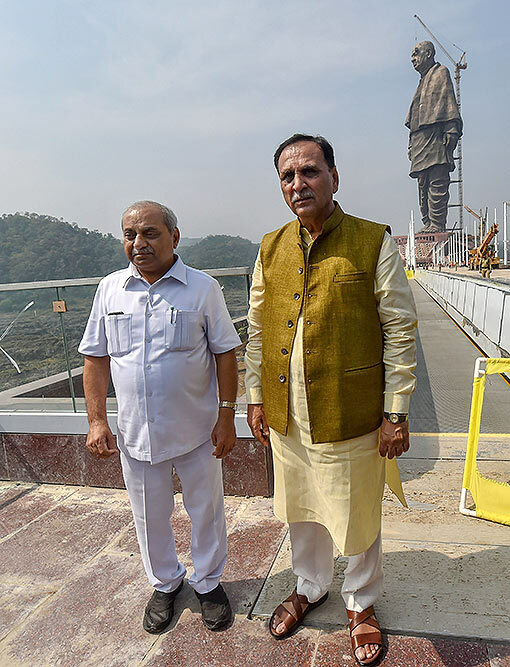 Talking to reporters on the sidelines of the BJP's national executive meeting, Rupani said the statue with a height of 182 metres will be a symbol of the country's unity and integrity. On Sunday, an angry Hardik sent back a government medical team in protest against the police lathicharge on his supporters who came calling during the day. The chief minister on wednesday visited the underground section of the Metro Rail near the main Kalupur railway station.